About 2,000 protest in Tel Aviv against public housing conditions in Israel. Protests also in Jerusalem, Haifa and Be’er Sheva. About 2,000 people arrived on Sunday evening at the government complex in Tel Aviv to demonstrate against public housing conditions in Israel. During the protest, the demonstrators tried to block major traffic arteries. At the same time, there were also demonstrations in Jerusalem, Haifa and Be’er Sheva. Five protesters were arrested during the demonstration in Jerusalem after they tried to block a street. The latest protests came following Saturday night’s self-immolation of Moshe Silman, a social justice protester who set himself ablaze during a rally in Tel Aviv, blaming government officials for his troubles. 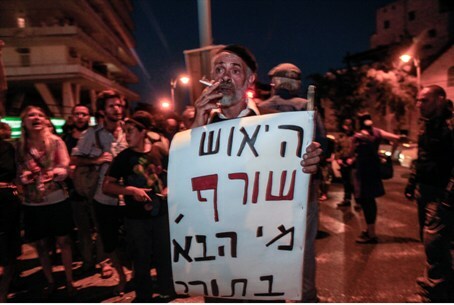 Prior to lighting the match, the Haifa resident handed out copies of a letter in which he called top government leaders “villains” and said he received no rent subsidy although he could not work after a recent stroke. Silman noted that he now receives NIS 2,300 in monthly disability benefits from which he pays for kupat holim (HMO) and buy medication and other necessities. In the letter he named Prime Minister Binyamin Netanyahu and Finance Minister Yuval Steinitz specifically for his economic problems. Silman was taken to the Ichilov Hospital and was later transferred to the Tel Hashomer Hospital, where he was being treated by the head of the hospital’s burns department. Silman, who suffered second and third degree burns over 90 percent of his body, was still in very serious condition as of Sunday night. Israel’s broadcast media was quick to promote the idea that Netanyahu is to be blamed for the failed and self-described homeless businessman's suicide attempt.